“I don’t think anybody in the world thinks more of her than I do,” Marc Jacobs said of his longtime collaborator, Katie Grand, at The Daily Front Row’s second-annual Fashion Media Awards at the new Park Hyatt Hotel Friday night. 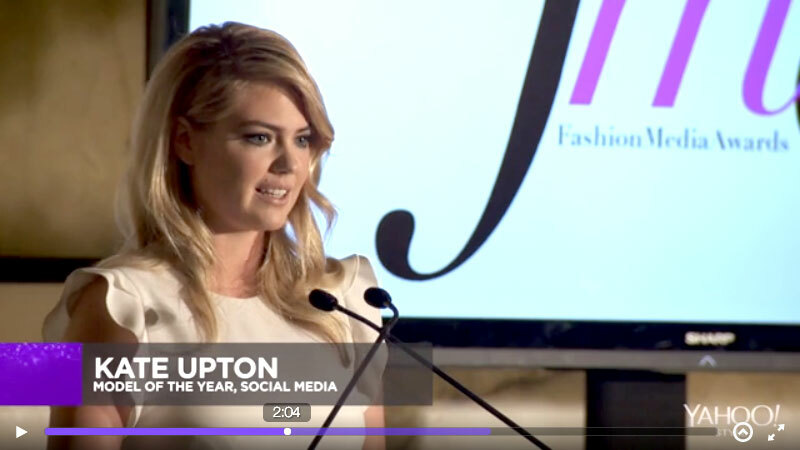 “Well, maybe her husband, Steve, does!” It was a lovefest all around, as le tout fashion came out en force to celebrate 2014’s most brilliant culture makers. Co-hosted by Gigi Hadid (resplendent in Tom Ford) and Yahoo Style editor in chief Joe Zee, it was a gathering for the record books, with old friends, colleagues, and even competitors from around the world rallying together under one roof to toast our industry’s best and brightest. The full FMA recap is in today’s splendid print issue, out at the shows right now. Not in the front row at the moment? Check out the digital version HERE! “I’m very proud to work at ELLE, and I think it’s been a rather interesting transition for me, coming from being on the men’s side for so many years. I thank David Carey and Michael Clinton for this opportunity. ELLE U.S. remains the cornerstone of a very, very big global network…. I’m very grateful to work with someone of Robbie Myers’ caliber. She’s a fantastic partner, and she has been so committed to ELLE’s ongoing relevance and success. Thanks for coming, Tom! What is it about you two? Tom: Oh, come on! My God, first of all, we’ve known each other for 20 years. Did you know that, Carine? What’s your favorite Tom Ford memory? Carine: When Tom asked me to walk with high heels on his back because he had a back problem. At what moment did you know you’d made it in fashion? Tom: Have we made it?! [Laughs] I never feel like I’ve made it. You have to keep working. That’s the way fashion is! You cannot stop. Carine: We are both never happy. Who did you invite to come along tonight? I’m in such esteemed company with the other people who are being honored and who are presenting tonight, that I’m so glad to have a lot of friendly faces around me. And Marc’s coming! I dragged him away from his work, and he told me this is the only thing he’s going to this Fashion Week, so I was a bit surprised he even came! What do you love about The Daily? That it’s there when you come into work, and it’s really jolly. It’s a nice contrast to Women’s Wear Daily, because it’s bright and immediate. When you’re stuck in a studio, you can really feel like something’s going on outside the studio when you read it. Plus, it’s always on Marc’s desk! What’s it like to be back at the FMAs as an alum? It feels like one big happy family! It’s like a reunion. I’m happy to see everyone after the summer break. Got any advice for this year’s winners? “Just enjoy it.” I wish I would’ve said that to myself last year. Why do you adore The Daily? It’s truly insider—and truly about the right insiders. Can I say that? A special thanks to our sponsors…Maybelline New York, Wolford, Evian, Gibson, Nicolas Feuillatte, and Cointreau. We thank you for making the FMAs possible. It was an exceptional, inspiring, and fun evening. AND! MERCI MILLE FOIS! To The Outnet’s private label Iris & Ink clothing, By Kilian, and La Perla for spoiling our VIPs with divine gift bags! Inside Today’s Issue Of The Daily! umm how much did saggy granny kris paid katie grand to give her teen daughter some coverage? katie grand lost her credibility entirely.